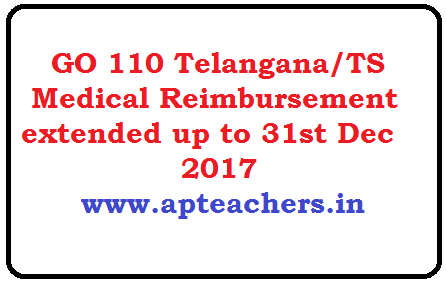 GO 110 Telangana/TS Medical Reimbursement extended up to 31st Dec 2017. Medical Reimbursement facility for Telangana Employees and Teachers has been extended up to 31/12/2017 in parallel with EHS. Health, Medical & Family Welfare Department – Employees Health Scheme – Providing Cashless Medical treatment to the State Government Employees, Pensioners and their dependent family members – Extended up to 31-12-2017 - Orders – Issued. G.O.Ms.No. 110 Dated: 29-06-2017. 12. G.O.Ms.No.181, HM&FW (A1) Department, dated:30-12-2016. 13. G.O.Ms.No.97, HM&FW (A1) Department, dated:7-6-2017. 14. G.O.Ms.No.98, HM&FW (A1) Department, dated:7-6-2017. In the reference 12th read above, orders have been issued for implementing Scheme of reimbursement and the employees health scheme in parallel up to 30-06-2017.